#10. Machine cost matters. He mentioned two different examples where one farm had machinery costs of $80 per acre and another $35 per acre. He stated its different for each operation. #9. Net farm income. Gross revenue is key, but know your costs. Your net income is what's really important. Set a goal to try and improve your profit. #8. Spend less than you earn. This is pretty self-explanatory. Bob mentioned several year's examples where what you earn was more than your living expenses. Then he showed a year where net income was negative yet, you still had your normal living expenses. This scenario would make for a very tough year. #7. Creative leases. Bob stated to work with the land owner on rents. Maybe start with a base rate and have an option for bonus rent on better years, maybe a percentage over a designated gross revenue total. #6. Embrace competition. Bob explained how your debt to asset ratio, your operating costs and your net income can vary 20-25% depending on your own circumstances. Do your best to keep these under control. #5. Monitor working capital. Bob used an example of a farm with $40,000 net income, $50,000 living expense, $10,000 income tax could produce a working capital of minus $20,000. Keep a handle on your available dollars. #4. Plan for your assets values to decline. Assets can be land values, stock market accounts, retirement accounts, machinery, inventory on livestock. All these type of markets rise and fall over the years. #3. Update ARC-CO payments. Mr. Rhea expects Hancock County to probably have 0 to maybe $10 per acre payment on corn and does not expect the county to have any bean payments. Prices were lower but yields were higher. #2. Term debt ratio challenge. Try to keep a handle on your available dollars that need to go toward big term debt. #1. Make a plan on a page. 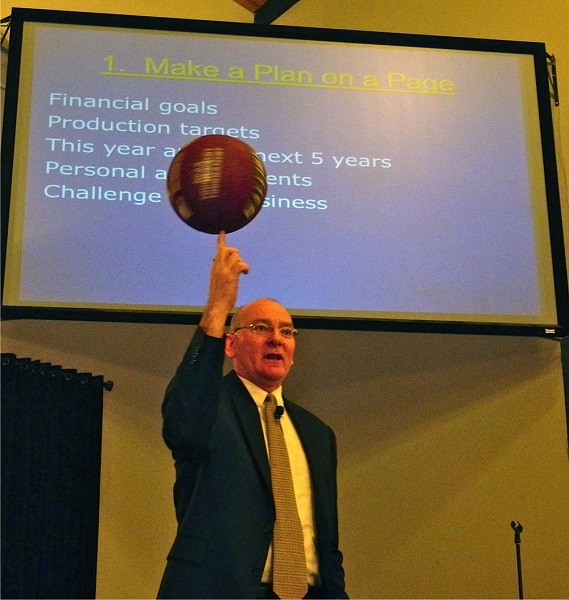 Bob states that you should put a plan on paper for financial goals and production targets. Stick to your plan. Write down where you are this year and want to be for the next 5 years. List personal achievements, challenge your business.